Ford is making good on its promise to add electrification to its new models, unveiling a redesigned 2020 Escape that includes two all-new hybrids. The new 2020 Escape is loaded with technology and offers drivers the choice of more cargo room or best-in-class rear legroom. 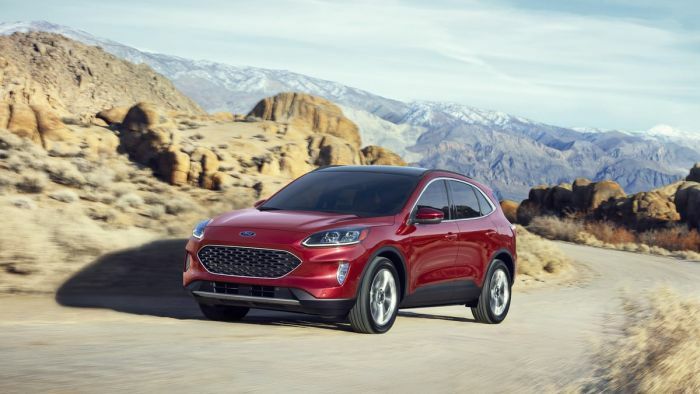 The Ford Escape is Ford’s second best-selling vehicle in the United States and Ford is scrambling to stay ahead of the pack in the quickly expanding small SUV segment. This is the fourth generation Escape. It was last redesigned in 2013. Perhaps the most striking exterior change is the new grille that closely resembles the grille on the new Mustang. The new Escape is lower, wider and longer than the current model, but it is also 200 pounds lighter, which should help improve gas mileage. It has a sloped roofline, liftgate spoiler and also sits lower to the ground than the current Escape. The all-new 2020 Escape features big changes under the hood. Drivers can choose from four different powertrains. The 2020 Escape will be available in a standard hybrid and also a plug-in hybrid version. The all-new 1.5-liter EcoBoost, is projected to produce 180 horsepower and 177 lb.-ft. of torque. To help save fuel, the 1.5-liter EcoBoost debuts cylinder deactivation, which senses when one cylinder isn’t needed and shuts it down automatically. Ford is promising best-in-class mileage numbers for virtually every powertrain model, however actual fuel economy numbers won’t be out until later this year. Gas engine-powered models as well as the standard hybrid are available with all-wheel drive. It should also be much more comfortable to ride in. The 2020 Ford Escape features sliding second row seats. The movable seats allow the driver and passengers to decide if the extra room needs to be used for more legroom or perhaps to increase the cargo space. If the seats are moved further back, the 2020 Escape will feature best-in-class maximum rear legroom. If the seats are moved further forward, the small SUV has room for four sets of golf clubs. Headroom, shoulder room and hip room all increase in the new Escape. The lithium-ion battery for the new hybrid versions is about one-third the size of the old battery. It will sit underneath the second row of seats, instead of taking up cargo room. The new Escapes will feature Ford’s suite of driver-assist technology known as Ford Co-Pilot360. It will also be available with a new version of the Active Park Assist for parallel or perpendicular parking and Evasive Steering Assist to help avoid collisions. There will also be an available 12.3-inch all digital instrument cluster. The 2020 Escape will also have a selectable drive mode system that allows the driver to choose the best mode for conditions, like sport, slippery and snow or sand conditions. The all-new 2020 Escape is built at Louisville Assembly Plant in Kentucky. The new vehicles are due in showrooms this fall. Plug-in hybrid units are due to arrive next spring. The 2020 Escape looks like a nice evolution of the existing Escape. My next door neighbors have a current-model Escape and they really like the car. To me the exciting news is the plug-in hybrid model. Unfortunately the PHEV Escape will not be available until next year. My guess is that Ford did not want to overshadow/undercut the debut of their Mach-E "Mustang styled" crossover/SUV coming out later this year, which will be more expensive, and will be a full 200+ mile range BEV. Ford has a lot of their hopes resting on this revised Escape, because they killed off their Focus, Fiesta and C-Max in the U.S., and have not shown anything else to fill that large market. I am certain that the Japanese, Korean, and European automakers are happy that Ford, GM, and Chrysler have given up on building small, affordable economy cars. I do not know what it means for American automaker's short-term profits, but it definitely will be bad news if gas prices ever go up again.